Images scanned at 300 ppi in TIFF format, then resized to 72 ppi JPEG format for web display. Photograph of the west-facing main entrance to the Neo-Gothic Episcopal Cathedral of St. John the Evangelist on Spokane's south hill. 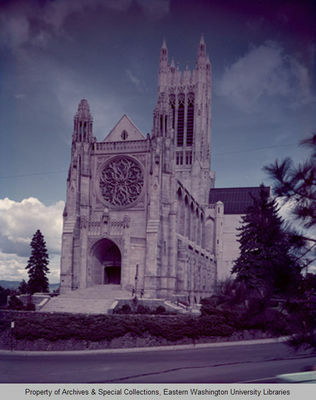 The cathedral was designed by Harold C. Whitehouse of the Spokane firm Whitehouse and Price. Building commenced in November, 1925, and was not completed until 1954. Photographer believed to be Harold C. Whitehouse, but may have been one or more employees of the firm Whitehouse and Price.